Removing Matilija Dam is no small task in a watershed that has seen significant changes since dam construction was completed in 1948. But after three years of study, a plan has been developed to restore the imperiled Ventura River ecosystem by removing the largest dam to date. “Full Dam Removal with Short-Term Sediment Stabilization on Site” evolved as the best way to deal with the sediment issue that vexes every large dam being considered for removal. Under this plan, immediate passage will be restored for the native steelhead trout, and controlled releases of sediment will gradually restore the natural riverine processes that nourish coastal beaches. Studies show that this approach, along with additional engineering features and a long-term adaptive management plan, will fully mitigate the potential downstream impacts from the project. The flowchart above illustrates the phases of the Feasibility Study that will lead to a final plan for Matilija Dam. The first phase, a “Baseline Conditions (F3) Report,” was completed in October 2002. The report concludes that since the watershed ecosystem will remain degraded with the dam in place, there is a need for a restoration project. Once a preferred alternative has been selected, there will be a public meeting with opportunities for public review and comment. Then the final design and Environmental Impact Statement (EIS) will be completed in preparation for the deconstruction of Matilija Dam. The current schedule is for completion of the study by the end of 2004. Implementation will depend upon funding. The Baseline Conditions “F3 Report” and other technical studies may be accessed at www.matilijadam.org. 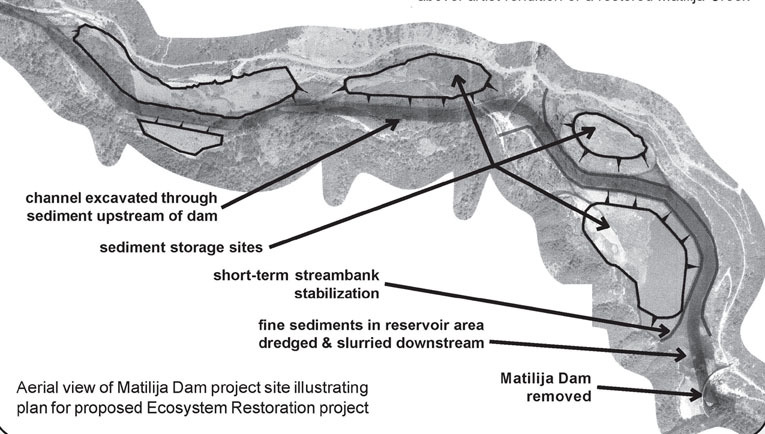 The Matilija Dam Ecosystem Restoration Feasibility Study began in the summer of 2001. The Army Corps of Engineers is the lead agency in a collaborative effort that includes many federal, state, and local government agencies. The goal is to determine the preferred method for removing the dam to restore the Ventura River ecosystem, while considering all the environmental risks and benefits. Since a dam of this type and size has never before been decommissioned, many areas of study are required to ensure success. The first step is to establish a "baseline", a detailed description of currently existing conditions in the watershed. Survey and Mapping will be performed to develop an accurate model of the watershed. Geotechnical Investigations will use the sediment core samples to characterize the sizes, distribution and content of sediments impounded behind the dam, and further fieldwork will characterize the riverbed downstream. Civil and Structural Design surveys will determine the structural condition of the concrete dam for the design of potential deconstruction methods. Hydrology and Hydraulic Studies will determine the erodability of deposits within the reservoir and the rate of sediment release that can be tolerated by downstream structures and aquatic ecosystems. Coastal Studies will examine effects on the environment at the mouth of the Ventura River and the potential for beach nourishment. The most critical element of the engineering studies is Sediment Transport Studies. This work will use all the information obtained from the fieldwork and subsequent analyses to develop computer simulations of the alternative removal scenarios. These simulations will determine the effectiveness of each approach and impacts on the watershed. Plan Formulation/Alternative Analysis will use all the technical information generated by these engineering studies to determine the preferred alternative for the final project. In addition to the engineering studies, Environmental Studies will include biological surveys and assessment of existing habitat, and an assessment of the future habitats to be restored by dam removal. This information is the critical link in the feasibility of the project, since federal funding will depend on the potential for Ecosystem Restoration as valued by these studies. Flooding: An examination of the historic flood records on the Ventura River revealed that Matilija Dam has never controlled peak river flows, and some localized flooding continues to occur with the dam in place. Levees have reduced the flood risk for much of the existing floodplain development. Sediment: Surveys of the reservoir indicate that it contains approximately six million cubic yards of sediment, including about 1.8 million cubic yards of beach quality sand. While the sediments tested clean, much of the beach sand is intermixed with fine sediment that is not suitable for direct use for beach replenishment. Studies estimate that the reservoir will completely fill with sediment by 2020, but will continue to trap sediments until 2030, when some coarse sediment will begin to pass over the dam. At that time the impounded sediments will total over nine million cubic yards. Habitat: The sediment trapped by Matilija Dam has significantly degraded the downstream river and coastal habitats. Surveys reveal that, downstream of the dam, sediment-starved “hungry water” has eroded the riverbed so that it now suffers a deficit of almost two million cubic yards of sand, gravel and cobble. The historically broad floodplain with many braided channels has become a single channel cut into the river bed. Sediment reduction has exacerbated beach erosion from the mouth of the river to the Ventura harbor. High quality habitat still exists in the upper watershed, but remains disconnected from the river and coast. Arundo donax, or giant reed, degrades the habitat value, and is spreading throughout the reservoir and floodplain terraces downstream. Dam: Structurally, the dam suffers from extensive “Alkali Silica Reaction,” a chemical reaction that weakens the concrete. Despite this problem, there are no structural modifications needed for the dam to remain adequately stable for next the 50 years. This section describes the initial alternatives screening process. The alternatives were further refined during the study, and the preferred alternative was selected based upon the habitat evaluation, cost, environmental impacts, and other federal selection criteria. A preliminary screening of the full range of alternatives was conducted. A total of 10 general concepts were ranked according to their effectiveness at accomplishing the key objectives of the study: restored habitat, fish passage, beach nourishment, and recreation. Also considered were relative cost and aesthetics. Each of the participating agencies submitted an alternatives ranking, and these were totaled and organized into a matrix. Matilija Coalition matrix is our scoring for the various alternatives. Overall ranking matrix shows each agency's total score and the overall average. The highest ranking alternatives are in green, lowest in red. The four highest ranking alternatives (listed to the right) will most likely be carried forward for analysis during the next phase of the study. Other alternatives being considered are; Pool & Riffle System, Partial Dam Removal/Full Sediment Removal, Partial Dam Removal/Natural Sediment Transport, Full Fish Ladder/No Dam Removal, Restoration of Dam, Fish Tunnel/ Bypass to North Fork Matilija. Each of these options will be described along with a rationale for their elimination in the Alternatives (F4) Report due for completion in June 2003. Dam is completely removed all at once with some sediment removal adjacent to dam for access purposes. The majority of the deposited sediments would remain, for natural transport downstream over time. Remove entire dam. Stabilize some sediment in place; remainder of sediment placed in upland areas and stabilized. Re-establish stream channel using natural topographic gradient (unlike pool and riffle system). 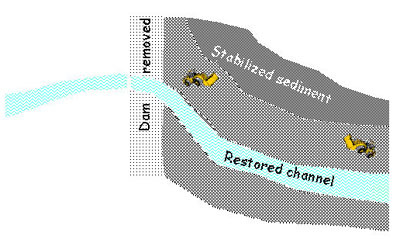 Dam and sediment is completely removed in one phase. Mechanical transport of sediments to disposal site via trucking, helicopter, slurry, or conveyor. Disposal site may include beaches, landfill, agriculture, etc. 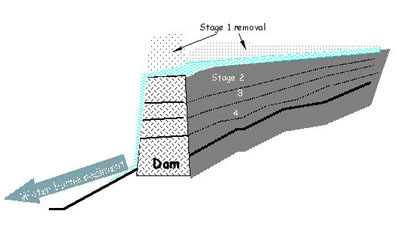 Dam is removed in segments (horizontal notching) in phases, over an extended period of time. The dam will act as a spillway allowing for sediment removal by natural transport as it is notched over time. 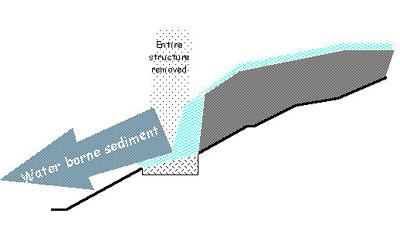 1A- upstream stabilization: sediment will be moved to one side of the reservoir to create a new stream channel. Sediment to be stabilized using rip rap and revegetated. In April, 2000, the Bureau of Reclamation completed an Appraisal Study that provided a preliminary evaluation of dam removal alternatives. While removal of the actual dam structure is straightforward, the technical challenges associated with handling the large quantity of impounded sediment will determine the ultimate cost and time scale for the project. In this study, for each dam removal scenario the concrete dam will be demolished and removed to a recycling plant. The project will include a new high flow bypass diversion dam to replace the current structure at Robles (diverts river water to Lake Casitas). The following alternatives reflect how the 6 million cubic yards of sediment will be handled. Note that the study eliminated single-phase removal and leave-in-place options because of their failure to accomplish project objectives. Matilija Coalition continues to play an active role in the Feasibility Study. We participate in the technical workgroups, drawing upon our collective expertise to provide comments and input to the study process. Our non-government partners include engineers, scientists, and policy experts with varied perspectives on this project of national significance. Please contact us if you have expertise to share.